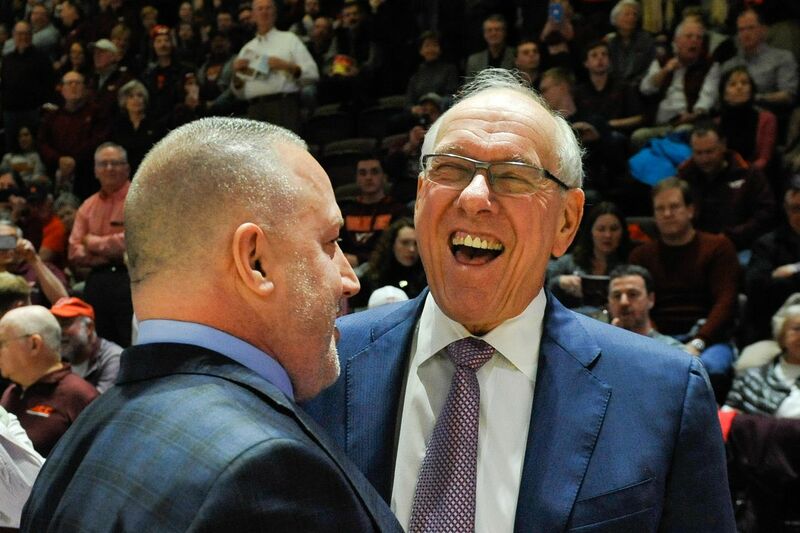 Syracuse Orange Head Coach Jim Boeheim has been announced as the recipient of the Court of Honor Award from the National Association of Basketball Coaches. Boeheim will be recognized at the NABC Court of Honor Gala in New York City on June 18th. Boeheim becomes the fourth coach to receive this honor joining Mike Krzyzewski, George Raveling and John Thompson, Jr. In other Boeheim news, as part of his discussion with Syracuse.com at the Final Four Boeheim touched on some of the biggest topics facing college basketball. Boeheim thinks the NCAA needs to get to work quickly to prepare for upcoming changes to the NBA Draft rules as he doesn’t feel that schools are ready for what’s coming. We’re not. The NBA is going to do what they want to do. They’re going to do what’s best for them; not what’s best for us. We have to figure out what we need to do. The challenge for college coaches continues to be how to handle the draft declaration rules. As Oshae Brissett explores his options Syracuse is left trying to balance between maintaining scholarship space and being able to replace his production. This is also a reason why the graduate transfer market has gained in popularity. When a team is left looking to replace a contributor this late in the recruiting cycle they can turn to a transfer. Boeheim points out that this method isn’t always a success for the player and new school. He added that he feels it hurts the “smaller schools” and those coaches but this feels just like a prominent coach looking out for others in his profession. The fact remains that these schools are often picking up graduate transfers from the P5 schools but we don’t notice them as often. The thing is 3,900 out of 4,000 college basketball players are very happy to have a scholarship. They’re happy. They’ve got a $70,000 scholarship and they’ve got money in their pocket. It’s the other hundred guys and they’re all going to make money playing basketball and the top guys are going to make a lot of money. Players get cost of attendance money, they’re taking their meal money because we give them meals and they’re getting $1,200 a month. If they need more, they can get a Pell Grant, they get another $600 a month. That’s $2,000 a month on top of a full scholarship. I think it’s a bit misleading to tell fans that every player is taking home $2,000 per month because as far as I’m aware Syracuse isn’t providing athletes with 3 meals a day for the entire year. It’s also important to note that only 17% of Syracuse students are receiving Pell Grants and even if an athlete is truly pocketing $2,000 each month it’s a small amount for their role in a billion-dollar industry. Despite some differences in opinion, it’s refreshing that Boeheim isn’t afraid to speak his mind and supports the notion that players can profit from their likeness. It’s coaches of his stature who can help push the change forward and help college basketball evolve.